"Only the court has the power to convict." Defense Minister Avigdor Liberman argues against "terror-promoting" media. Despite his earlier public statements condemning suspected soldier Elor Azariya, Defense Minister Avigdor Liberman (Yisrael Beiteinu) cautioned today against making hasty judgements - in a message especially tailored to the media. Defense Minister Avigdor Liberman, Agriculture Minister Uri Ariel (Jewish Home), and Social Equality Minister Gila Gamliel (Likud) visited among the Bedouin today. During the trip, Liberman commented on what he sees as the media's irresponsible support of terrorism over the IDF, as in the case of accused soldier Elor Azariya. "Israeli media should remember that in the state of Israel, like all democratic countries, only the court convicts, or in this case, [the military court]. Not the media; rather, the courts. Anyone who hasn't been convicted, is innocent, and that includes Elor Azariya, and the soldier of Netzah Yehuda." 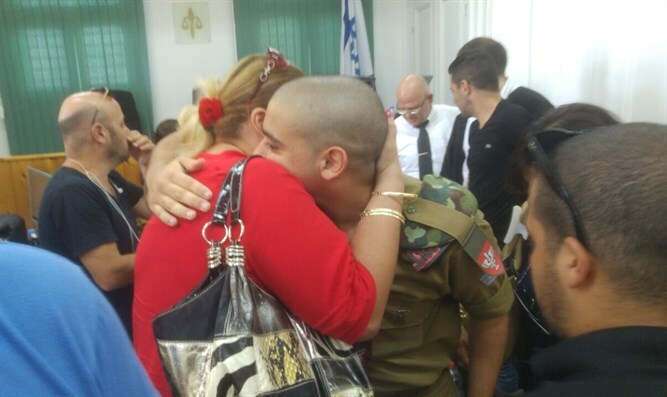 Azariya is standing trial for killing a wounded terrorist in Hevron. Last week, an unnamed soldier of the Netzah Yehuda Battalion (a.k.a. Nahal Haredi) shot and killed an Arab who charged the post he was guarding near the Binyamin town of Ofra. While Azariya's trial reconvened after a month's intersession, the unnamed soldier has been warned that he may stand trial for manslaughter. "Second, it's worth remembering that people who fight terror daily, who fight terrorists, cannot operate with a lawyer at their side, and therefore their decisions are correct or not, but it is wrong to create a situation where a soldier needs to call a lawyer before he goes out on an operation," Liberman added. I would have expected Israeli media to make an effort and to strengthen Israeli deterrence against the enemy, and not to deter the Israeli soldiers in the fight against terrorist and against terror. I want free press, not media which intimidates the soldiers of the IDF.